Having the sensation where everything tastes salty in your mouth can be very annoying taste disorder. Having a constant salty taste in your mouth can make many foods and beverages taste like salt. For some people, the salty sensation in their mouth comes and goes, while for others it is difficult to get rid of the salty taste in their mouth. Most of the time, a feeling that everything tastes salty isn’t connected with a serious health problem. Some of the reasons for a salty taste in the mouth are dehydration, bleeding from your gums, hormonal changes, or a vitamin deficiency. Usually, when the underlying reasons for the taste disorder that causes the salty taste have been resolved, your sense of taste should return to normal. In this article, I will look at the common reasons for having a salty taste in your mouth even when you haven’t eaten anything salty. This will help you know how to resolve the change in your taste sensation and stop everything tasting salty when you consume foods and drinks. What Is a Salty Taste in the Mouth? 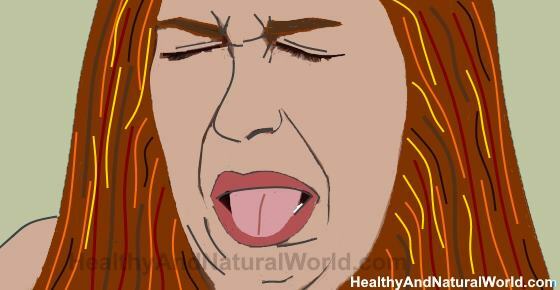 A persistent salty taste in your mouth can be described as a taste disorder where the sensation of your taste buds is altered. Having a proper sense of taste and smell are essential to enjoying food and drink and can also help detect food that has gone off. If food and drink taste too salty even though you haven’t added salt, it can affect your enjoyment of eating. In fact, having a salty taste in your mouth when you haven’t eaten anything with salt can cause distress and frustration. In fact, Dr. Bromley says that if you have a blocked nose, food may taste too salty, sweet, sour or bitter even though your sense of taste is fine. Let’s look in more detail at the most common reasons why everything you eat or drink tastes salty. Having a runny nose because of an allergy or infection is a very common reason for having a salty taste in your mouth. According to doctors from the Mayo Clinic, a runny nose can cause excess fluid or mucus to drain down the back of your nose.2 This can run down the back of your throat, and the salty taste of nasal fluid could be felt in your mouth. Some common reasons for a runny nose with or without nasal congestion are hay fever, acute sinusitis, suffering from the cold or flu, nasal polyps, or injury to your face or head. If you suffer from a blocked nose that is making everything taste salty, you can try using some effective essential oils for getting rid of a stuffy nose. Essential oils of eucalyptus, peppermint, and tea tree can help to quickly resolve a sinus infection naturally. You can also try these home remedies for blocked and stuffy nose, or try this acupressure technique for clearing stuffy nose in 1 minute. A salty or metallic taste in your mouth could be the result of oral bleeding from your gums or inside of your cheeks. Blood has a natural metallic or salty taste and if you have gingivitis (bleeding gums) or mouth ulcers, you could have a constant salty taste in your mouth. There are many home remedies to treat gums that regularly bleed after brushing and cause a frequent salty taste in the mouth and they are covered in my article on how to get rid of gum infection (gingivitis) naturally. Also, licorice is known to fight tooth decay and reduce oral inflammation, or you can try the ancient Ayurvedic technique of oil pulling. If mouth ulcers are the cause of the salty metallic taste in your mouth, then you will find some effective home remedies in my article on how to quickly get rid of mouth sores. A salty taste in your mouth could also be caused by other kinds of dental problems. If you think that dental issues are making everything taste salty to you, you should visit your dentist for a checkup. Taste disorders where everything tastes salty and bitter can be the side effect of certain medications. If you think that medications are affecting your taste buds and causing a salty taste, you should look at the list of side effects or talk to your doctor. Heartburn or acid reflux may make the taste in your mouth feel bitter and salty. A chronic form of heartburn is gastroesophageal disease (GERD). As well as causing a bitter salty taste in your mouth, GERD can cause a burning sensation in your chest, a persistent sore throat, or a feeling like you have something stuck in your throat. If you have the symptoms of heartburn, you can try drinking baking soda and water. Baking soda helps to neutralize stomach acid and can quickly relieve the discomfort heartburn causes. You can find more home remedies for heartburn in my article about 12 effective natural treatments for heartburn and stomach ulcers. Everything may taste bad or salty in your mouth if you have a hormonal imbalance in your body. Hormones can affect the sense of taste in your body and if your hormones are out of balance, you might have a persistent salty mouth. There are many foods that are great for balancing your hormones. You should also know the signs of low progesterone as that can cause menstrual upset like cramping before your period and heavier menstrual flow. A salty mouth could be the result of a vitamin deficiency. It’s essential to enjoy a healthy well-balanced diet to make sure your body doesn’t lack essential nutrients. If everything tastes salty in your mouth, it may mean that you suffer from a dry mouth. Other symptoms of dry mouth are thick stringy saliva, persistent sore throat, or a grooved tongue. Some ways to remedy dry mouth syndrome is to chew sugar-free gum, sip water frequently, and breathe through your nose. Sjogren’s syndrome is one reason for having a dry mouth that can make food and drinks taste salty. A cerebrospinal fluid leak can cause severe headaches along with a persistent salty taste in the mouth. A CSF leak happens when a tear or hole in the membrane around the brain or spinal cord lets fluid leak. Sometimes CSF leaks are caused by trauma to the head, but in many cases the cause is unknown. Other warning signs of a CSF leak are increased sensitivity to light or sound, pain between the shoulder blades, drainage from the ear or nose, or ringing in the ears. If you have undergone a course of treatment for cancer, you may have a salty taste in your mouth for a while. In most cases, the annoying salty taste in your mouth should go away. This is especially true if the salty mouth was caused by an infection, runny nose, or dental problems. When you treat the underlying cause of the salty flavor in your mouth, you should notice that your sense of taste returns to normal. Am Fam Physician.2000 Jan 15;61(2):427-436. WebMD. I get a salty taste in my mouth after I brush and rinse. PatientInfo. Smell and taste disorders.